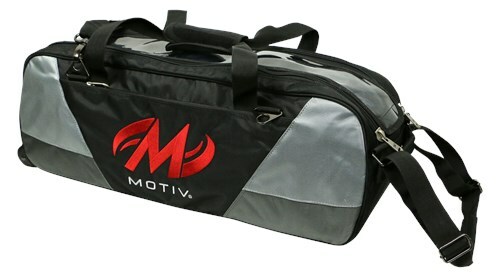 The Motiv Ballistix Triple Tote/Roller has a compact design that is perfect for travel or league play. The clear-view top makes it easy to see the arsenal of bowling balls inside. The padded shoulder strap and rugged tote handles give you the options you need to carry this three ball bag. This could be anywhere from 5-7lbs when empty. Due to the time it takes to produce the Motiv Ballistix Triple Tote/Roller Black ball it will ship in immediately. We cannot ship this ball outside the United States.